The National Theatre production of WAR HORSE returns to the Alhambra Theatre, Bradford – THE ONLY VENUE IN YORKSHIRE! War Horse, the unforgettable theatrical event based on Michael Morpurgo’s beloved novel, gallops back into Bradford from 14 February - 10 March 2018 at the Alhambra Theatre, following a sell-out run at the theatre in 2014. THE ONLY VENUE IN YORKSHIRE! The 34-strong cast includes Yorkshire born, lifelong Bradford City Fan William Ilkley as (Arthur Narracott) and Thomas Dennis as (Albert Narracott), in his Alhambra Theatre debut. Thomas will be the third generation of his family to appear on the Alhambra Theatre stage. His Great Grandmother performed with the Sherman Dancers and his Great Uncle was a Saxophonist who both enjoyed treading the boards at the Alhambra Theatre years before him. The rest of the cast are: Marcus Adolphy (Carter), Adam Barlow (Greig/Schweyk/Sergeant Fine), Peter Becker (Friedrich), Joelle Brabban (Emilie), Lucas Button (Joey Hind), Jasper William Cartwright (Billy/Heine/Klebb), Jo Castleton (Rose Narracott), Chris Charles (Joey/Topthorn Heart), Jonathan Charles (Bone/Vet Martin), Sebastian Charles (Topthorn Heart), Anna Chessher (Joey/Topthorn Head), Nicky Cross (Joey/Topthorn Hind), Bob Fox (Song Man), Max Gallagher (Geordie), Chris Garner (Allan/Manfred), Andrew Hodges (Sergeant Thunder), Lewis Howard (Joey Heart), Ben Ingles (Lt Nicholls), Billy Irving (Goose/Schnabel), Elan James (Topthorn Hind), Kiran Landa (Annie Gilbert), Gwilym Lloyd (Ted Narracott), Jack Lord (Klausen), Stephen Love (Topthorn Head), Toyin Omari-Kinch (David), Samuel Parker (Joey/Topthorn Hind), Tom Quinn (Joey/Topthorn Head), Domonic Ramsden (Joey/Topthorn Heart), Arinder Sadhra (Paulette), Tom Stacy (Joey Head), Elizabeth Stretton (Matron Callaghan), and Simon Victor (Stewart/Heine/Ludwig). Experience a remarkable story of courage, loyalty and friendship, about a young boy called Albert and his horse Joey, set against the backdrop of the First World War. 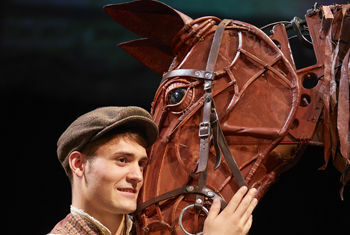 Featuring ground-breaking puppetry work by South Africa’s Handspring Puppet Company, which brings breathing, galloping horses to life on stage, War Horse, directed by Marianne Elliott and Tom Morris, and adapted by Nick Stafford, is the most successful play in the National Theatre’s history. War Horse, which has been seen by over seven million people worldwide, completed its record-breaking eight year London run at the New London Theatre on 12 March 2016. It has won 25 awards including the Tony Award for Best Play on Broadway. War Horse has been seen in 97 cities in 11 countries, including productions on Broadway, in Toronto and Berlin, with touring productions in the UK and Ireland, North America, the Netherlands, Belgium and China. War Horse is directed by Marianne Elliott and Tom Morris, designed by Rae Smith, with puppet direction, design and fabrication by Basil Jones and Adrian Kohler for Handspring Puppet Company, lighting by Paule Constable, and movement and horse choreography by Toby Sedgwick, with video design by Leo Warner and Mark Grimmer for 59 Productions, songmaker John Tams, music by Adrian Sutton and sound by Christopher Shutt. Katie Henry is the revival director and Craig Leo is the associate puppetry director. They are joined by resident puppetry director, Matthew Forbes and resident director, Charlotte Peters. The tour of War Horse coincides with the Centenary commemorations of the end of the First World War and follows the production’s sold-out tour of the UK and Ireland in 2013-2014. War Horse is produced on tour by the National Theatre.